What an exciting day Wednesday! Bianca & Stephen's wedding at the Highlands Country Club in Garrison, NY was featured on Style Me Pretty. I love, love, love Style Me Pretty and am on it daily. To see my floral designs on there again was beyond words. Thank you Bianca and Stephen for being such a wonderful couple to work with. Also thank you SMP for your inspiring website and to the amazingly talented Caroline Frost of Frost Photography for capturing this beautiful wedding through her lens and being awesome to work with. I had such a great time planning this wedding! The bride and groom, Amanda and Brian planned their day all the way from Grenada! Brian is finishing medical school there, but they wanted to celebrate their marriage back home in Saratoga Springs. I had the chance to meet with Amanda and her mother Susan in person while she was home during the holidays. Amanda really wanted her wedding decor to have a bit of bohemian flair balanced with tradition. 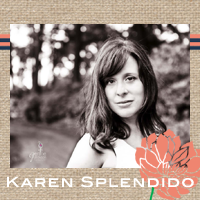 Her vision resulted in an enchanted yet classic event. Christopher Morris Photography was there to capture the day and was very kind to share some of his great pictures! 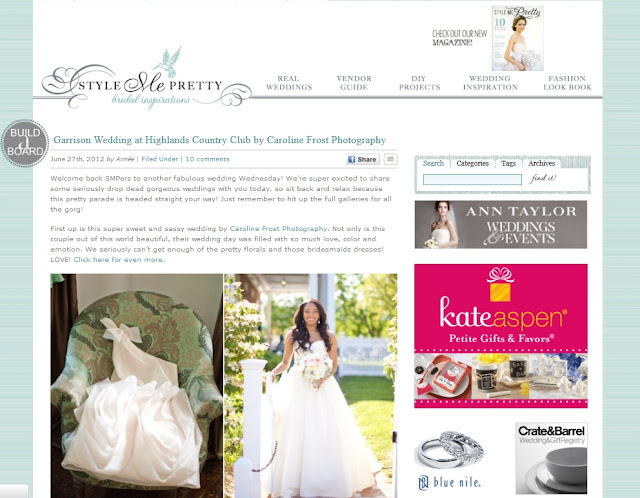 This blog is a combination of his great images mingled in with my charming yet far from professional photos! 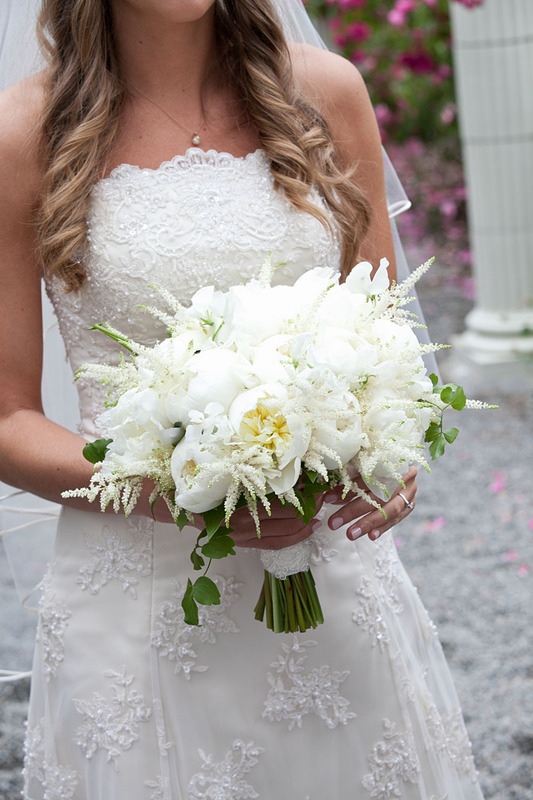 Amanda carried a lush bouquet of white peonies, white sweet peas, ivory garden roses, fluffy white astilbe, and clematis vines. It had an ethereal vibe to it, and smelled amazing! 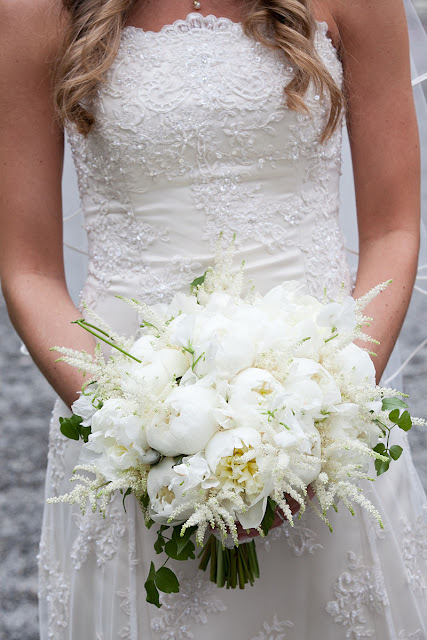 I added some lace trim with subtle sparkle to the top and bottom of the bouquet handle. The bridesmaids carried abstract elfin bouquets of peonies, scabiosa pods, purple callas, dusty miller, astilbe, larkspur and a touch of lavender. 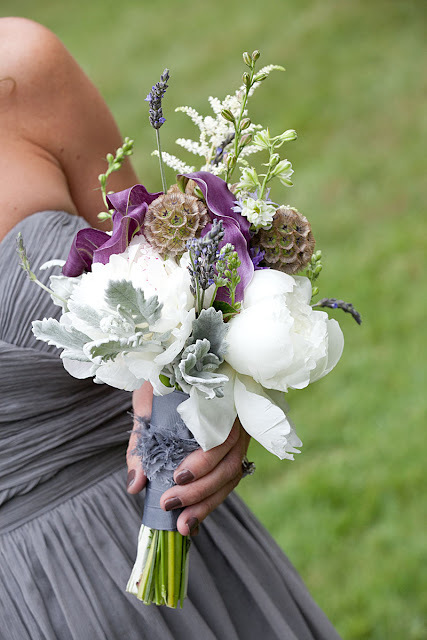 I added this ruffled detail to the bouquet handle on a whim, I knew Amanda would love it! I spend a lot of time over the year either on skype, phone calls,or email with my clients. I often feel that by the time of the wedding rolls around we are old friends. Trust is a beautiful thing! 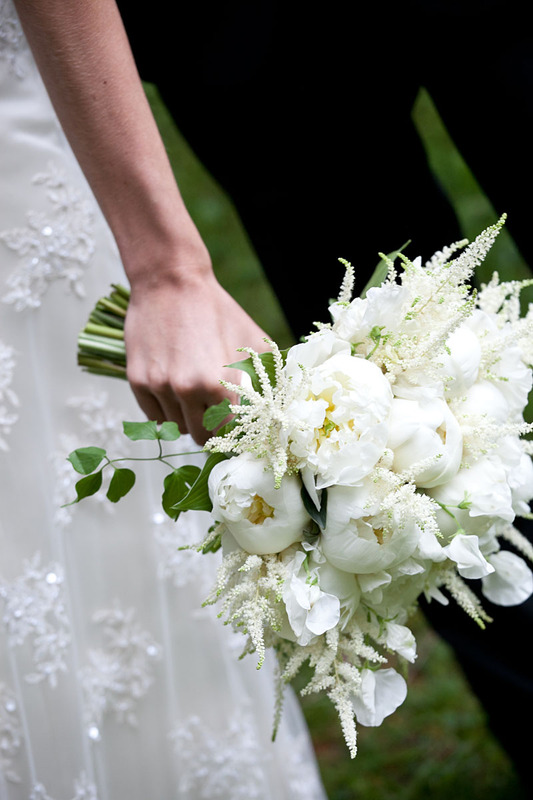 The mothers carried simple posies of peonies and dusty miller. I much prefer these to corsages, it gives them something to do with their other hand while walking down the aisle. The walk is a big deal for the moms too! I was in love with the asymmetrical composition of the bridesmaids bouquets. A delicate crown of fresh lavender and astilbe for the flower girl. The groom wore a scabiosa pod with a touch of astilbe and clematis vine to compliment Amanda's bouquet. 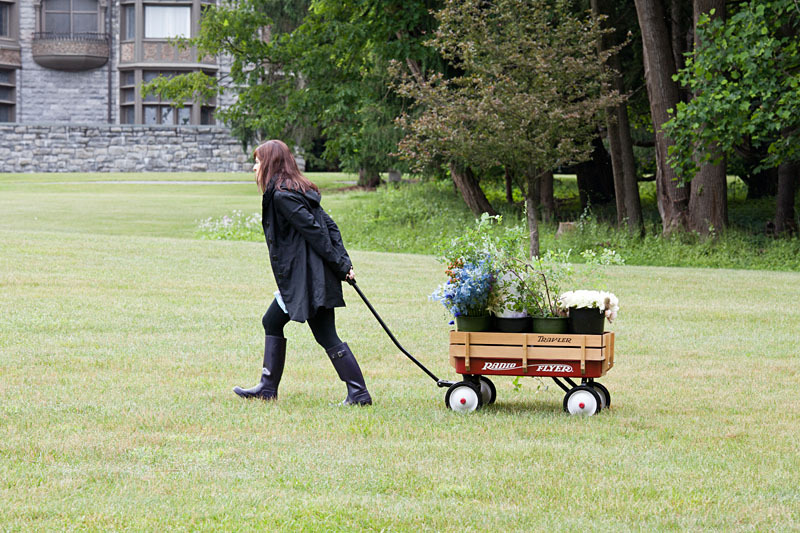 Here I am hauling some flower goodness to the rock garden section at Yaddo in Saratoga Springs. It is an amazing series of gardens and an artist's retreat. Each trip back and forth to the van to reload was a quarter mile! John and I figured we each walked 4 miles during the set up, sounds exhausting, but I was so excited and filled with adrenaline that it did not occur to me until I was on the ride home! I love the rock garden. I know most people prefer the rose garden , which is glorious - but I felt at home among the trees and ferns. We had a great time designing and constructing this wedding arch onsite. At one point I had to lean back and decorate it while John was holding me up. Something I will never forget! Curly willow, blue delphinium, garden roses and hydrangea adorned the arch. I cry at every wedding, even when I am hiding behind the scenes. The commitment and the significance of the vow exchange never gets old. The Reverend Joy Burke officiated the ceremony. She is great, and most definitely loves her job!!! Who wouldn't? This was a fun little find in the back of the rock garden by one of the waterfalls. 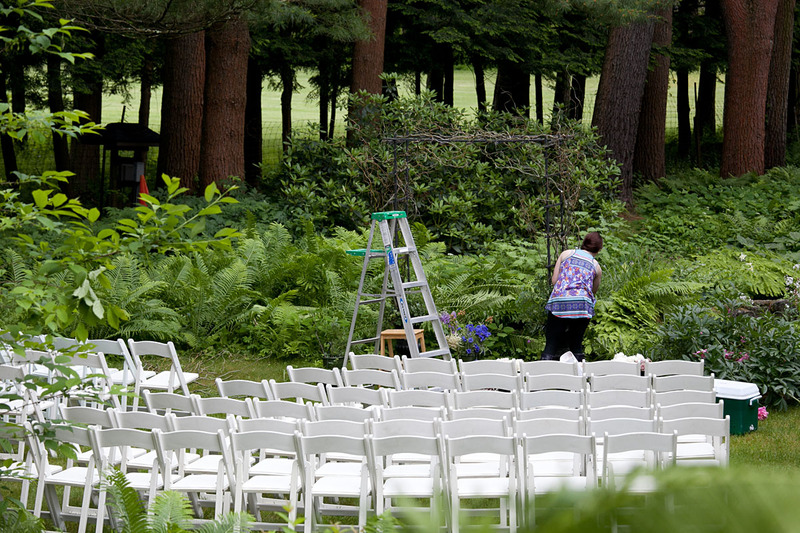 The dinner party reception took place at Longfellows, just down the street from Yaddo Gardens! 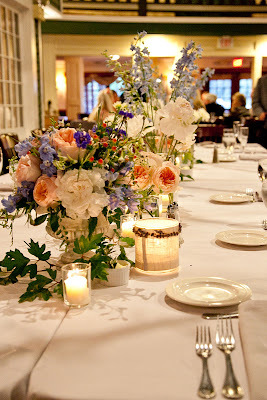 The guest tables were decorated with lush arrangements of garden roses, peonies, delphinum, cornflower and hypericum berry. 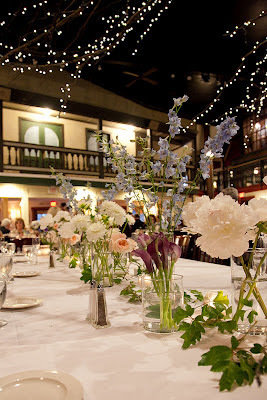 The head table displayed single varieties of the flowers used throughout the wedding. I love how this design allows you to appreciate each flower individually. Trailing greens gave a runner effect, love it! Thank you Amanda and Brian for having us be apart of your celebration! Enjoy your time in Grenada, I think it is the beginning of many chapters and adventures in your life together! Congratulations!!! A couple of weeks ago, I designed the wedding flowers for Bianca and Stephen. 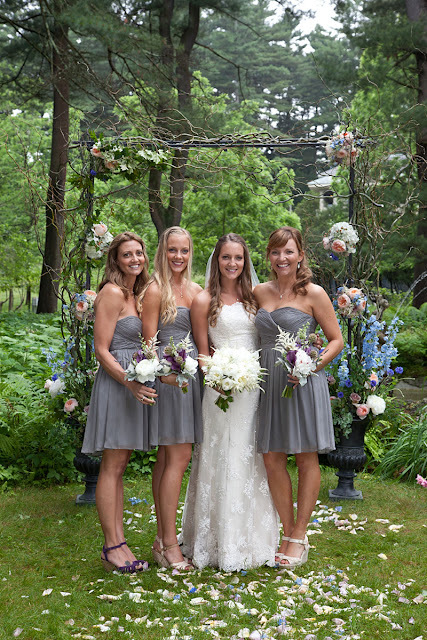 The wedding ceremony and reception took place at the GORGEOUS Highlands Country Club located in Garrison, NY. 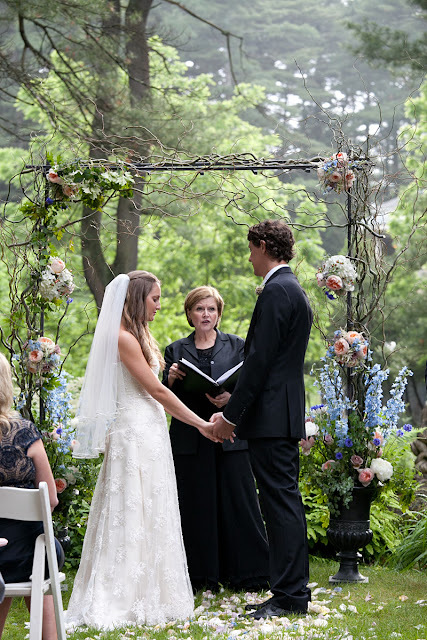 The day, the couple, the family, the venue were just...perfect. 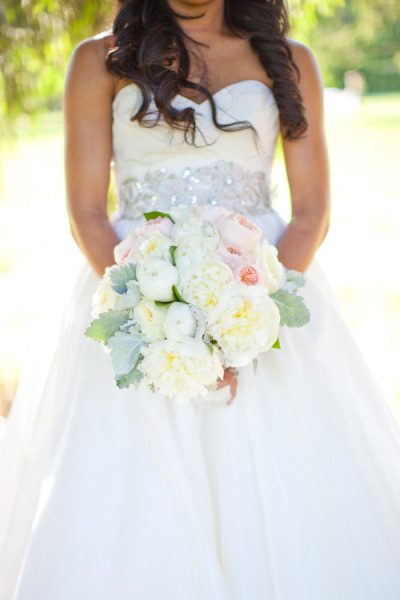 Bianca carried a lovely bouquet of peonies, garden roses, hydrangeas, and dusty miller. The stems were wrapped in silk satin with a lace overlay. It smelled divine! The bridesmaids carried lush bouquets of coral charm peonies, hypericum berry, garden roses, and dusty miller. Delicate wrist corsages for the mothers. Boutonnieres of hypericum berry, bouvardia, and dusty miller. The groom also had white hydrangea and ranunculus buds. A large and lush focal arrangement of coral charm peonies, parrot tulips, garden roses and ranunculus. I loved this piece - and yes, I had a hard time parting with it : ) . Some of the reception tables in the atrium were decorated with lanterns and wreaths of flowers. 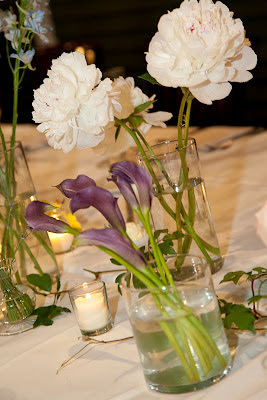 In the main ballroom, the centerpieces were designed on metal cake plates, and overflowed with sherbet hued botanicals. Spirea dripping from the mantel. The grounds of The Highlands Club were breathtaking. The whole place just exudes relaxed elegance and charm. I also had the pleasure to work with the talented Caroline Frost of Frost Photography. To see more of this wedding, check out her blog post. Stunning photos Caroline! Update - just saw on the Frost Photography facebook page that this wedding will be a main page feature on Style Me Pretty in the next 4-6 weeks. Yay! Thank you so much Bianca and Stephen, it was wonderful to work with you! I wish you many, many years of happiness together - you are off to a beautiful start!